Take a look at the above photos, it is the same scene taken only seconds apart. 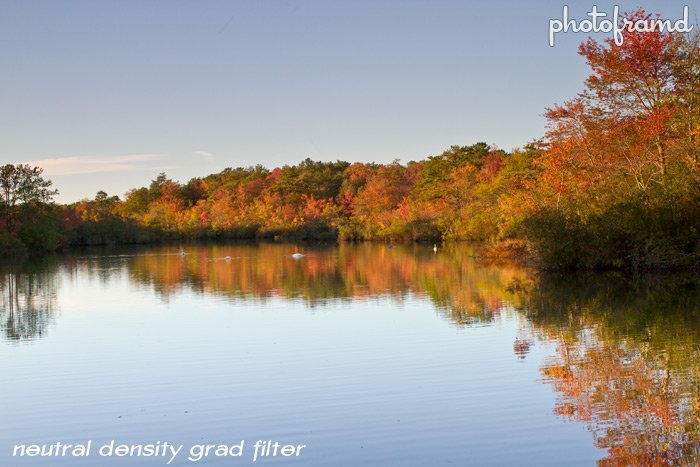 The only difference is the use of a neutral density graduated filter. These filters do not screw on the from of the lens like a UV or polarizer filter. They are used in a gel filter holder (like the Cokin filters). I have tried several brands, but my favorites are the Lee Filters. I use the Lee .9 Neutral Density Graduated Filter size P. It is a very neutral gray with a gradual gradient from top to middle which will reduce the amount of light by 3-stops (at its darkest point fading to clear). 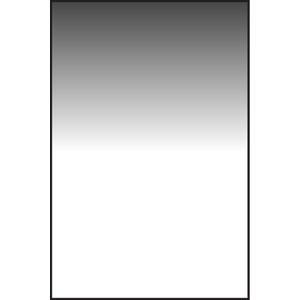 This difference is perfect for reducing the brightness of a sky to balance with land or water. The Lee Filters are optically clear (except for the gradient) and the size P filters are really BIG, perfect for a 77mm lens. They are so big in fact, that I do not use the filter holder. I just hold it up to the front of the lens with plenty of fingertip room to spare. 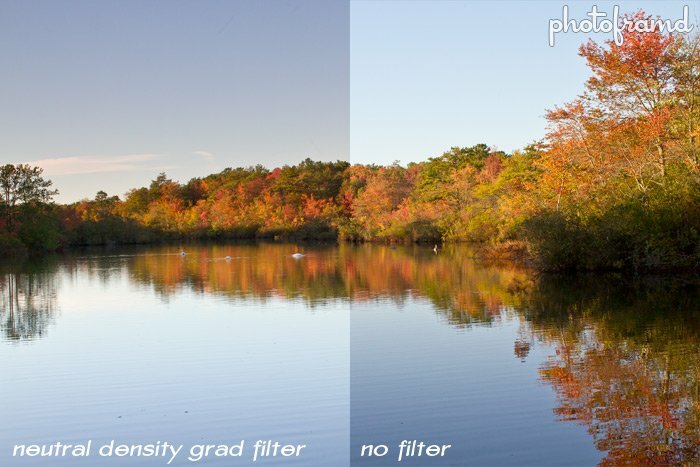 In looking at the above photos side-by-side, you can see how the filter balances the sky and water to approximately the same brightness. The photo with the filter looks better. Take a look at the larger versions below. The difference is very obvious once you have seen them side-by-side. 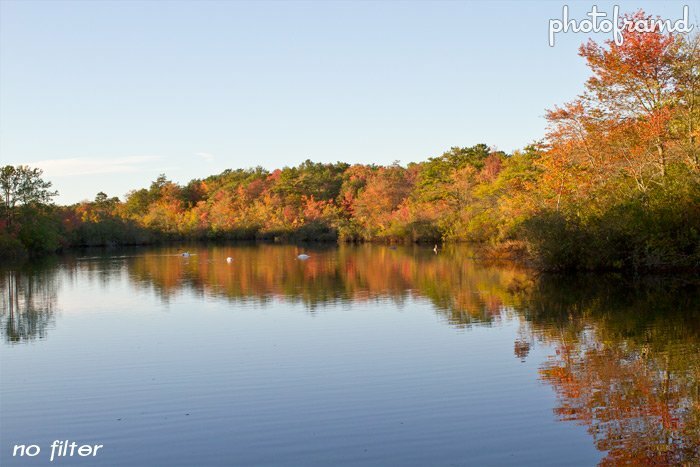 But, you can also create this balanced effect Camera Raw 5 (with CS4) or 6 (with CS5). 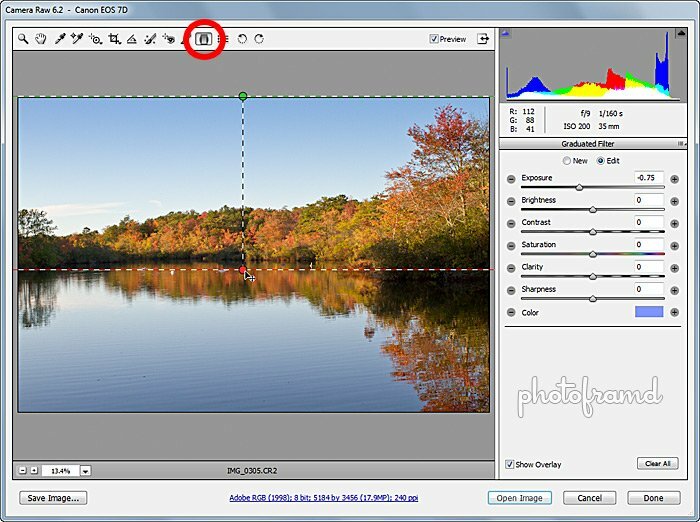 In Camera Raw, just use the Graduated Filter Tool. The photo in this example is the same “no filter” photo from above. With the Tool, click just above the top of the photo while holding the Shift key and draw straight down as far as you need. The default settings should be good enough to improve the photo, but it is an Adjustment Layer with an additional set of controls on the right. Since this is Camera Raw, these change are non-destructive and do not effect the original file. ← Previous Previous post: Canon 7D Tips – What should my first lens be?